Thank you to everyone who participated in the nomination process. Although the categories are very broad, they were created to reflect the primary practice areas in San Diego County. 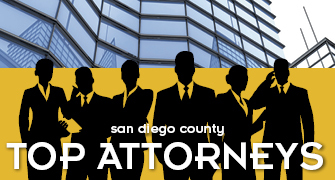 We recognize that there are many specialty practice areas among San Diego attorneys, but cannot accommodate them all. Many specialty practice areas fall under the existing general categories - for an in-depth look at the categories, please see the Practice Areas Examples. If there is an overwhelming request for additional practice areas, they will be considered for possible inclusion in next year's Top Attorneys. Workers' Compensation, Discrimination, Wage & Hour Class Actions, Employment Law Counseling, Termination, Union Issues, Management Representation, etc.